How many letter Y's can you find in this picture? Give your little one a fun way to practise her ABC's with a coloring page! She'll find all the hidden Y's in this picture, which is a good way to prepare her for writing. How many Y's can your child spot in the "Pussycat, Pussycat" rhyme? 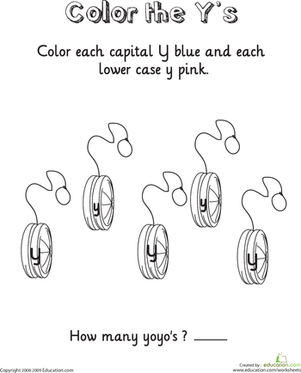 Kids find and count each letter Y in the rhyme on this year one reading worksheet. Your child will love reviewing her alphabet letters with this "W" coloring page. She'll try to find all the letter N's in this peacock picture. How many can your child find? 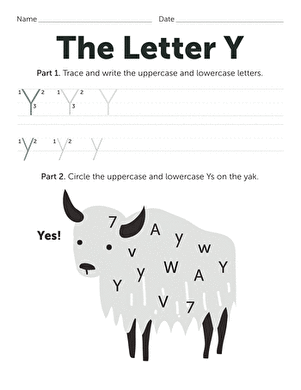 Have fun while reviewing the ABC's with this alphabet coloring page. "X" marks the spot! Help your little learner find all the letter X's in this funny picture. She'll hone her letter recognition skills as she colors.